Simpcw First Nation Chief Nathan Matthew credited Parks Canada and Jasper residents for their reconciliation efforts with one of the region’s bands of indigenous peoples. The Fitzhugh’s online story prior to the Simpcw’s hunt had over 100 shares and 200 engagements on Facebook. Much of the engagement had negative perception of the hunt, and took aim at Parks Canada for allowing it. “We don’t want to be confrontational… This is a good demonstration of how to do (reconciliation) in a respectful way,” Chief Matthew told the Fitzhugh on Tuesday. He said the Simpcw and Parks took time to find a sufficient level of agreement on the hunt’s time, location, species to be hunted and by what means. “It’s an exercise of a constitutionally protected right. 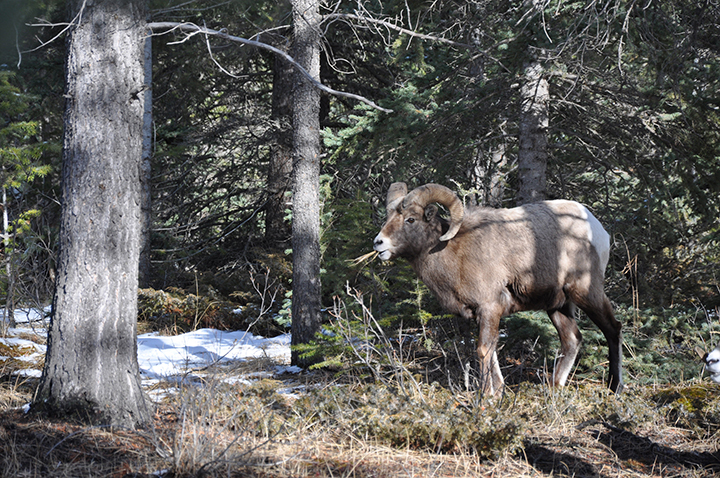 If we don’t exercise our rights, we might lose them,” he says, adding community hunts are common throughout the region, mentioning one had taken place in neighbouring Mount Robson Provincial Park. Though bowhunters were present on the Jasper hunt, Chief Matthew confirmed the Simpcw used rifles, too. “We use most of the animal, and use it for community purposes,” he says. Many critics on social media took issue with the definition of traditional, saying that traditionally, indigenous peoples wouldn’t have been using rifles and modern tools. However, Chief Matthew says despite using modern tools, community hunts are opportunities to educate the community’s youth on traditional Simpcw ways of life. “We had a couple of youths, who have now killed a couple of animals. It’s very positive,” says Chief Matthew. “A community (or traditional) hunt is planned by band members, it’s not just one or two people deciding to go for a hunt on a random day. It’s organized and coordinated for a number of people together.” He said nine people went on the hunt plus another half dozen for moral support. Parks Canada originally closed the Snaring River area from Oct. 6 – 13 to allow the Simpcw to hold a traditional harvest. Chief Matthew says the week-long window was simply to avoid complications due to weather, but the hunt is now over. The hunters, travelling on foot, harvested a total of three elk, two bighorn sheep and one white-tailed deer. “Harvest rates will be kept within a sustainable level based on park surveys of the species, and will not have an impact on the sustainability of the wildlife populations in Jasper National Park,” Steve Young, public relations and communications officer for JNP, said in a press release issued last week. The Simpcw had been communicating with Parks for a number of years regarding their wish to hold a traditional harvest on their traditionally used lands within the Jasper National Park (JNP) boundaries, according to Young. The federal government is committed to nation-to-nation reconciliation, he said. “This was simply re-acquainting ourselves to our traditional territory,” says Chief Matthew. Indigenous peoples all across the country conduct traditional harvesting for fishing, hunting and plant collection, including inside some of the country’s national parks, according to Parks. Back in August of 2016, the Simpcw First Nation held a symbolic return to Téte Jaune Cache — some 100 kilometres west of JNP — 100 years after the Simpcw peoples’ forced removal from Tête Jaune to the band’s current reserve, Chu Chua. Chu Chua is located near Kamloops, British Columbia, and is roughly 243 kilometres southwest of Tête Jaune. Local Simpcw storytellers and archives estimate between 60 and 70 Simpcw people were forced from Tête Jaune, with some renditions of the story saying the trek took long enough for a full change in season, with the Simpcw leaving Tête Jaune in the fall and arriving in Chu Chua in winter. Soon after and to make matters worse, the Spanish Flu epidemic in 1918 ravaged the Simpcw community, killing many of the northern people who had so recently arrived at Chu Chua, according to Simpcw archives.